This week is finals week. The week when every single college student I know gets a little frazzled. The week when we all question our major and our sanity because we stay up all night cramming for a final in the hardest class we have. This week is a make it or break it situation in our classes, I'm aiming for A's across the board and this semester it's going to take some serious studying and brain power to accomplish that. 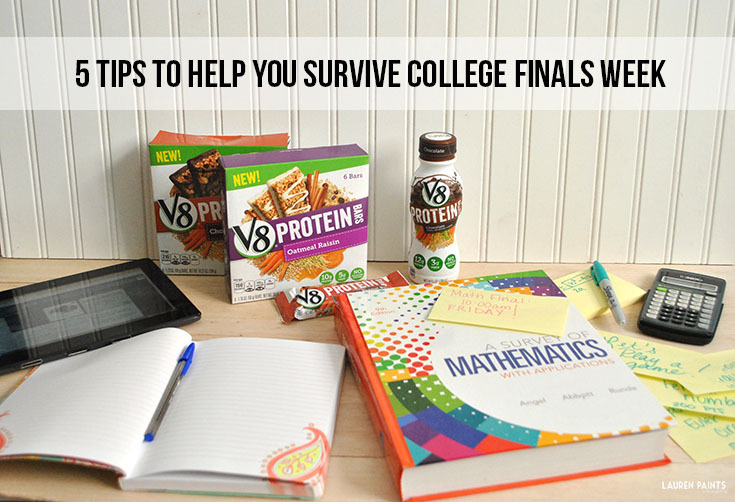 Luckily I have the new V8 Protein shakes and bars to help my nutrition stay on track and these awesome study tips to help me prepare for finals. 1. Ditch the junk, eat food that's good for you: I'm working pretty much 24/7 on something for the blog and hubs works full time and both of us are in school full time so we don't always have the time to cook a healthy and complete breakfast, lunch, and dinner - especially this week. With my weight loss going so well (read more about my weightloss journey here), I've still been struggling to get enough protein in my diet regardless of what I've been eating. 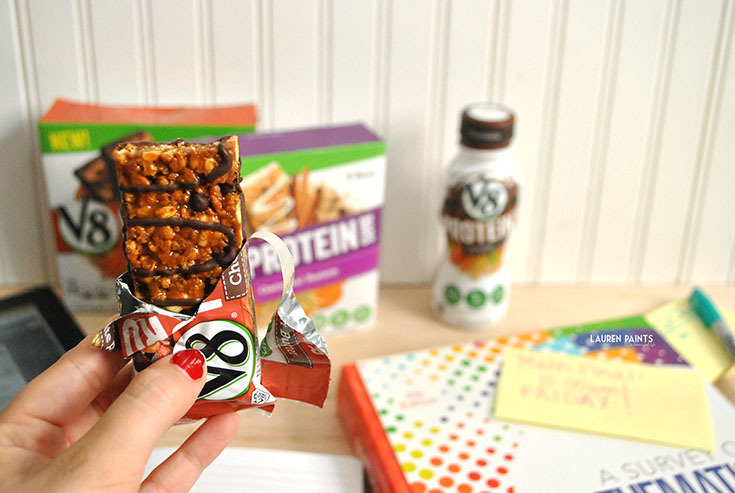 Thanks to V8 Protein, I'm able to eat a delicious protein bar and get some of my veggies in all while saving time! With 10g of Protein and 5g of Fiber in the bars and 12g of Protein and 3g of Fiber in the shakes, I'm happy to snack on these delicious treats! V8 Protein shakes and bars come in six different delicious and decadent varieties, allowing you the little indulgence you need everyday while still remaining healthy! I love that when I'm sipping my chocolate protein shake I am getting the nutrients from sweet potatoes and carrots and proteins from milk, soy, peas, brown rice, and quinoa! 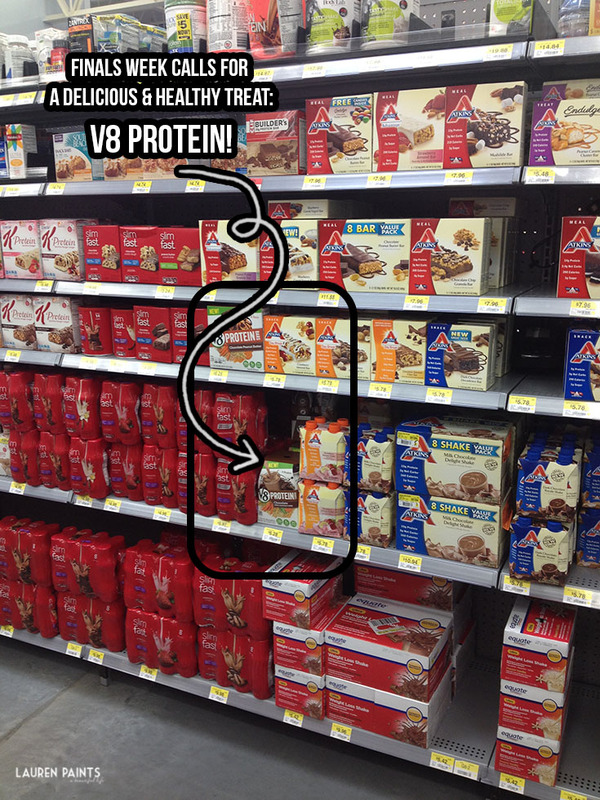 Interested in trying some V8 Protein Shakes & Bars? I found mine at Walmart in the Health & Beauty section. 2. Make the tough stuff into a game: This may seem simple, but it works. Make every single question you are struggling with into a fun game by awarding yourself points when you get an answer correct. This is WAY more fun when you have a study buddy so I suggest one of those as well! 3. Put on some tunes and READ: My final for speech feels like it is full of information that I already know but after my mid-term I know better than to expect him to give us super easy questions. This means I'll need to buckle down and read all these hand-outs so that I get the vital information. 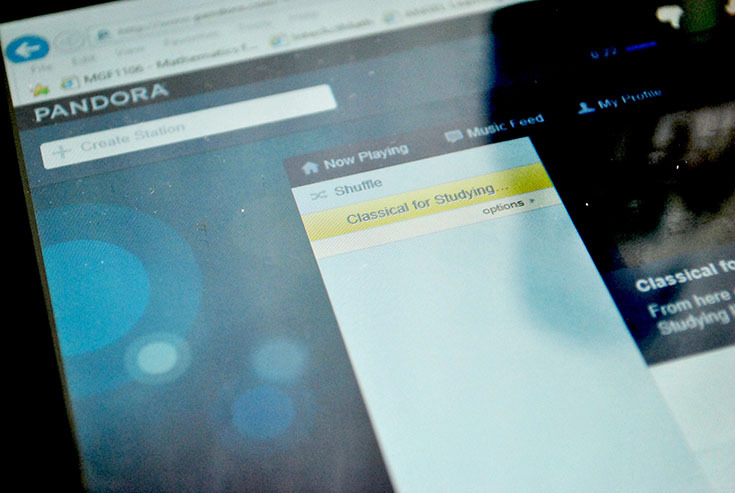 Since it's not the most interesting information, I like to rock out to some music that doesn't have words; the Pandora station "Classical for Studying" seems to be a favorite this semester. 4. Take a break and doodle: I know it sounds silly and almost counteractive, but relaxing a little before taking your test will help! 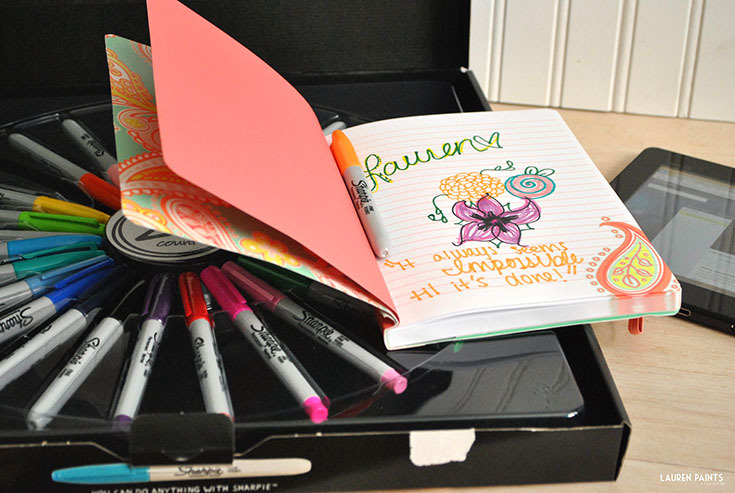 I love to doodle so busting out my notebook and sharpies is part of my plan. I suggest you do something that you know relaxes you - maybe read a book, paint your nails, or go for a short walk and get some fresh air. Don't spend too much time "doodling" but enjoy a second to just breathe. 5. 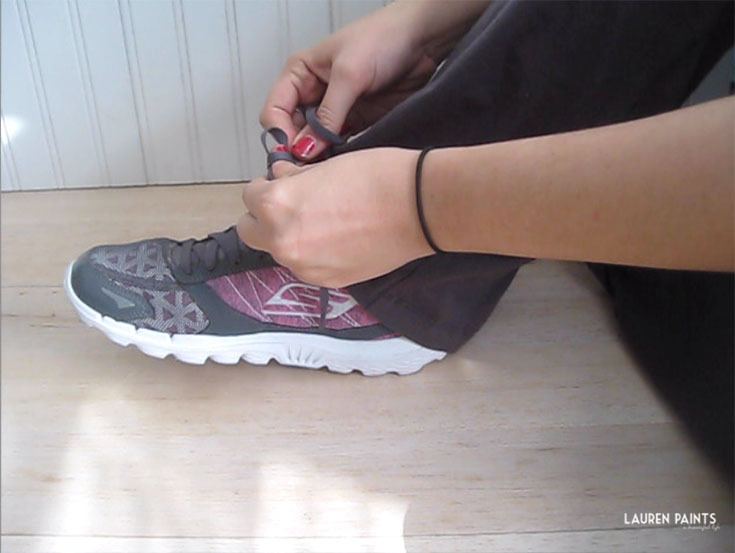 Take the time to hit the gym: This week I am going to the gym RIGHT after class. That means I'm showing up in my gym clothes - not so cool, but you have to do what you have to do! I'm excited to burn off calories on the treadmill and really exhaust my body as much as my mind has been. 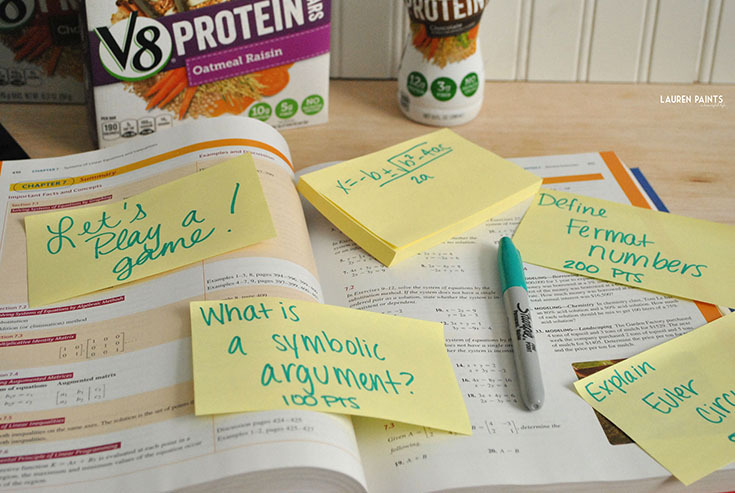 Do you have any study tips to share? I'd love to hear them!